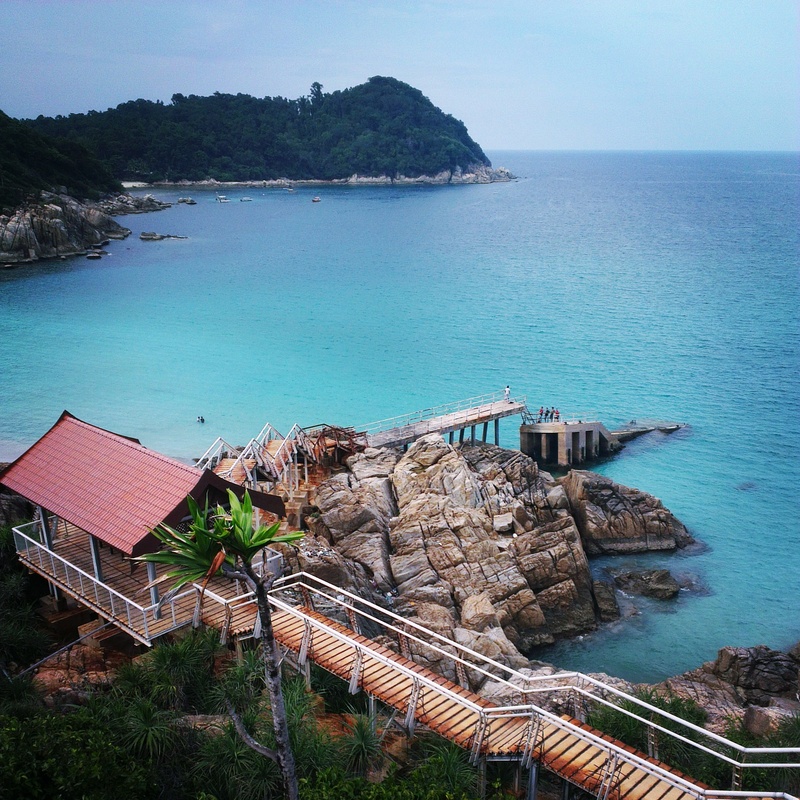 Perhentian Islands – the crown jewel of Peninsula Malaysia’s east coast. 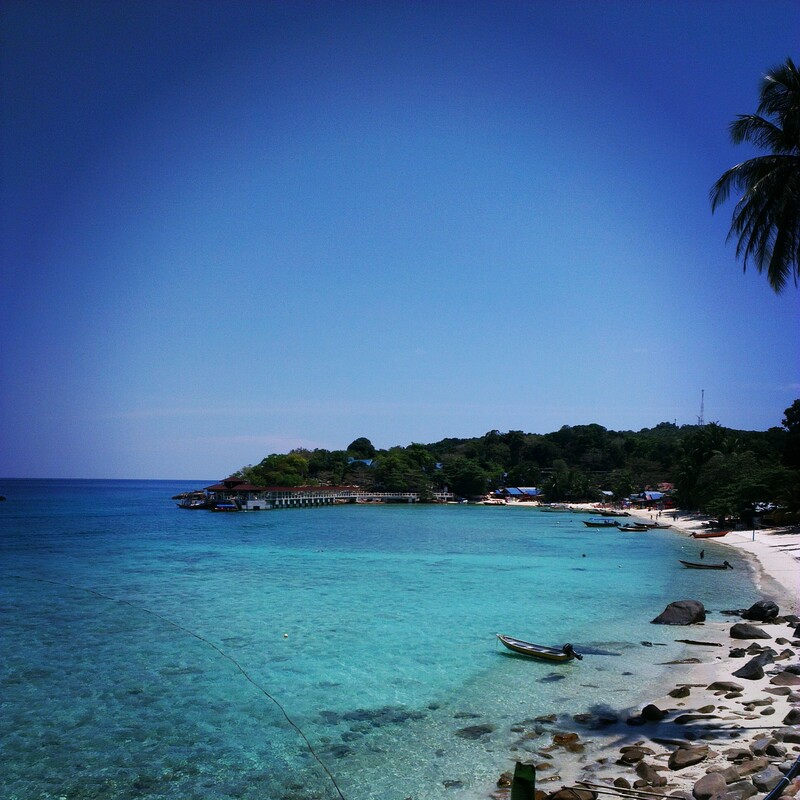 It consists of Perhentian Kecil (Small Perhentian) and Perhentian Besar (Big Perhentian) with both islands accessible from the fishing village of Kuala Besut, Terengganu. The former is suited for backpackers seeking budget-friendly accommodation while the latter has resorts geared towards family-oriented crowds. Having been there in two separate occasions, here’s a recap of Perhentian Kecil in its full splendor. Perhentian Kecil’s main strip with a killer view. Long Beach overlooks the South China Sea and a part of Perhentian Besar while its soft white sand caresses your every step as you make your way into its emerald-blue waters for a dip. Homely cafes and chalets are dotted along the coast while snorkeling and dive centers are ever ready to take you out for an excursion with the fishes. It does get busy at certain times of the day with boats ferrying passengers and people frolicking around but if you like to be part of the crowd, this is the place to be. When the sun sets, it’s time to fold the umbrellas and lay out the blankets. Beach bars and hookah joints that went unnoticed during the day suddenly become the watering holes for revelers in need of a drink or a whiff of watermelon gum-flavored smoke. Things would heat up after 10 p.m. when the fire show starts – all brought to you by the kind travelers who decided to stay for a bit and learn to throw flaming sticks into the air. Sure, Long Beach might not be as epic as Thailand’s full-moon party but it has a bit of everything to make everyone happy. Long Beach’s quieter neighbor is located on the other side of the island facing the mainland with a stunning view of the sunset. Coral Bay has pretty much the same thing that Long Beach has to offer but what it lacks in buzz, it makes up with an awesome array of seafood stalls. My favorite joint is Amelia’s Cafe where the fish, squid, prawn and slipper lobster are grilled to perfection and served with tasty sauces (especially the garlic butter sauce!). It’s so good and cheap that I wouldn’t mind embarking on a 15-minute hike across the island from Long Beach to savor the fresh seafood on display every evening. Azure waters and awesome seafood awaits at Coral Bay. Here’s an off-the-beaten-path trail to those looking for a bit of an adventure. There’s an abandoned windmill farm on the northern part of the island; the Dutch-powered windmills were expected to produce electricity for the islands but it was found out to be unsuitable to operate in the current wet tropical climate of Malaysia. However, it provides a beautiful backdrop for some cliff diving. The hike to Windmill Hill starts at the the other end of Long Beach and it’ll take you roughly 20 minutes to reach the top. Once there, you’ll face a breathtaking view of the bay followed by 900-odd steps descending to an abandoned jetty. Those who dare can plunge into the warm waters of the sea while those who play it safe can soak themselves by the cove. End your trek across Windmill Hill with a jump off the abandoned pier. Perhentian Islands are two slices of heaven that welcomes all, be it honeymooners, family vacationers, party-goers and scuba divers. This is where a 10-minute boat ride will take you swimming with the sharks or sunbathe on secluded beaches; where a hookah smoke-filled night is lit up by an incendiary fire show; where a banana pancake sunrise is complemented by a grilled barracuda sunset. This is island life at its best. The annual monsoon season runs November – March while peak season is around May – September. You might want to book your accommodation ahead during the peak season and school holidays due to high demand. If you’re taking a flight from Kuala Lumpur, it is more convenient to fly to Kota Bharu because it is closer to Kuala Besut than Kuala Terengganu by 30 km. Unlike its neighbor Redang Island, there are plenty of choices for food at Perhentian so depending on your budget, you can either scrounge for fried rice or splurge on seafood. I LOVE the Perhentians! !! Langkawi is enchanting but the Perhentians personifies a true island getaway.